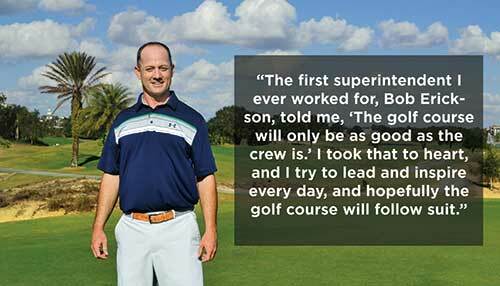 Superintendent // Lake Nona G&CC, Orlando, Fla.
What can I get you? IPAs have been hitting my tongue just right lately… Cigar City has one called Jai Alai that’s excellent. How did you and (wife) Stephanie meet? When I worked at Sea Island, she was the merchandiser for the pro shop. Every morning I’d call in to report on conditions. I fell in love with her voice first and then I got to know her. Tell me about Lake Nona G&CC. It’s a 30-year-old club with a very prestigious membership that includes world-class athletes. It’s got a rich history of events, including the inaugural Solheim Cup, but most people know us for the Tavistock Cup, the event between us and Isleworth. What teams do you root for? I graduated from N.C. State, so they have half my heart. I also root for Auburn because I spent part of my childhood in Alabama. It’s 50/50 and I can be swayed either way, depending on who is winning. What’s your favorite tool in the shop? A good ol’ ball mark tool. I can fix ball marks while at the same time getting a good feel for root density and moisture. What’s your most cherished piece of sports memorabilia? I’ve got a signed flag from Davis Love III, thanking me for hosting his event at Sea Island. It reads, “To Brandon, thanks for your hard work.” I also had Chris Kirk, the winner, sign it. Davis brought it down to the shop himself and handed one to me and the assistant. He’s a big part of Sea Island, he’s like the ambassador there. When was the last time the crew got excited, and what was the occasion? I’d like to tell you it’s every morning before we send them out — we try to get them jazzed up each morning. But in reality, it was when we took a long lunch the other day to watch the Brazil-Mexico World Cup match. But it wasn’t the result they wanted. What’s the coolest or craziest thing you’ve seen on the golf course? The coolest thing I saw is also the craziest thing. I saw a bald eagle and an osprey wrestling over a redfish in mid-air. And the osprey won! It’s a big bird, but it was half the size of that bald eagle. You’re flying to Scotland tomorrow for the Open Championship and some golf. What part of the trip are you most excited about? I was fortunate to go to Ireland in 2015. I’m looking forward to seeing the Open at Carnoustie, seeing the course in all its glory. And I want to enjoy the culture — I had such a great time in Ireland, I expect much of the same in Scotland. As interviewed by Seth Jones, July 16, 2018.